Craig Wilson’s eye-popping harvester load on an HO scale Proto2000 flat car. I’m recovering from a busy RPM Chicagoland weekend in Lisle, IL. The days seemed to blur right by like a speeding train. I took some notes to offer a summary. If you haven’t attended a railroad prototype modeler (RPM) meet, I encourage you to take action and attend a meet near you. The RPM event calendar is updated frequently with dates and links to these events around the country. Resin Car Works lead minion Frank Hodina has finished working on an HO scale Fruit Growers Express reefer. This project uses a mini-kit that will be given to a couple hundred RPM Chicagoland attendees next week. 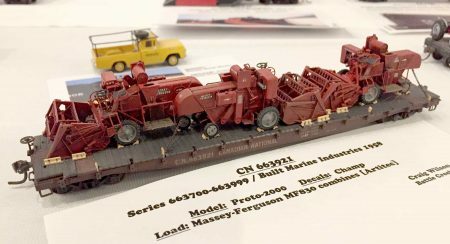 Bob Hanmer sent details covering a special operating session on his HO scale Great Northern and Duluth, Missabe & Iron Range layout that serves the mining region. We think you will enjoy this. Taconite is a hard rock found across the northern parts of Michigan, Wisconsin, and Minnesota. It contains about 30% iron, so for most of the 20th century it was considered waste. That is until the war efforts of World War II and the Korean conflict severely depleted the existing reserves of high quality iron that could be fed directly (or with a little beneficiation) into a blast furnace. A variety of N scale freight cars and locomotives were displayed. The 2016 RPM Chicagoland has wrapped up and many are in recovery mode. A big round of thanks goes out to Mike Skibbe and his crew to coordinate this year’s version of the popular prototype modeler meet. We have a few images to share and hope you jump over to this image gallery for a closer look at many other models.